In Under the Mountain, left, the carefully cut and positioned components carve out large architecturally abstract relationships of mountain, rock, sleeping moon/hiker. The narrow band below the mountain suggests a shadow as does the flecked paper of the plain below, all within a discreet format. In the 60's Banks, a painter, became interested in the effect of cast shadows on colorand turned to sculpture. Her large, planar sculptures of geometric, classic shapes made from toned plexiglass and wood were constructed to allow cast shadows of varying intensity to alter visual forms and color of the sculptures. The same kinds of light altered shapes and color are expressed in the collages whose symbolic meaning is heightened by the titles. These collages show a mastery of understatement and composition. Banks is the author of What is Design? : An Overview of Design in Context from Prehistory to 2000AD, (www2.xlibris.com). The book, an essential desk reference for professionals and students, is of interest to anyone decoding cultural history. 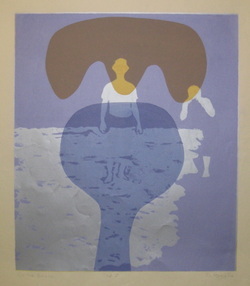 ANNE J BANKS: On the Beach, silkscreen, 21x 19 1/2"
Anne Banks thought, lived and breathed in the world of art. A member of The Cabinet since its inception, her work on paper has been featured in several exhibits. A consummate designer, Banks was interested in cast shadows and the effect of shadows on color, which she explored in sculpture and later in silkscreen and collage. She also used forms she derived from mythic and archetypal sources as the basis for paintings to reflect a divine harmony between man and nature. Banks was also an art writer, teacher and art community builder. She was instrumental in establishing the commercial and fine arts program at the Northern Virginia Community College (NOVA), Alexandria campus, which she chaired for several decades. During her career in Washington DC, she wrote articles and reviews for city art journals, exhibited in numerous juried shows, taught fine and commercial art and wrote What is Design?, a concise, indispensible book for anyone seeking an understanding of the history of design from prehistory to modern times. While on the board of Gallery 10 in Dupont Circle she encouraged artists doing experimental work. She supported the National Museum of Women in the Arts, and was part of The Washington Women’s Arts Center, an organization that created opportunities for women artists to exhibit their work. Banks graduated from Gunston Hall in Washington DC, Wellesley College (B.S. ), and George Washington University (M.F.A.). A chemistry major, she soon recognized her deep love of, and skill in, art and, around the time of her marriage to Bill Banks, attended art school in New York City and Honolulu. Marriage to a naval officer meant picking up roots every two years or so, and during her time in California, Hawaii, Norfolk, Stonington, Scotland (UK), and finally northern Virginia Anne became a prolific and well-recognized artist. She continued writing and collage work after her move to Hartford, CT about eight years ago. She persisted in spite of a debilitating illness creating beautiful compositions. She picked the work for this show with her usual enthusiasm. Her quiet humor never diminished. She died peacefully on September 23, 2013 surrounded by her family.